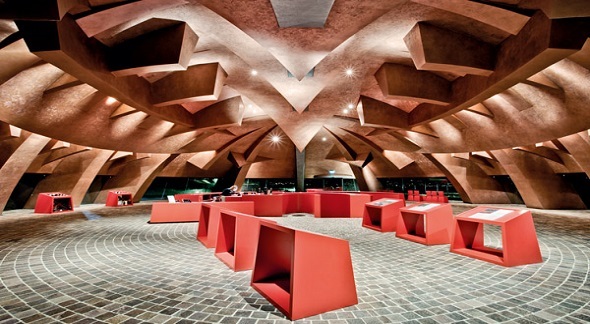 The Carapace is a unique masterpiece of art, that mixes the boundary between sculpture and architecture in a functional way to the context in which it is inserted: the Castelbuono estate and its vineyards, immersed in the typical Umbrian countryside near Bevagna and Montefalco. It is the first sculpture in the world in which we live and work. 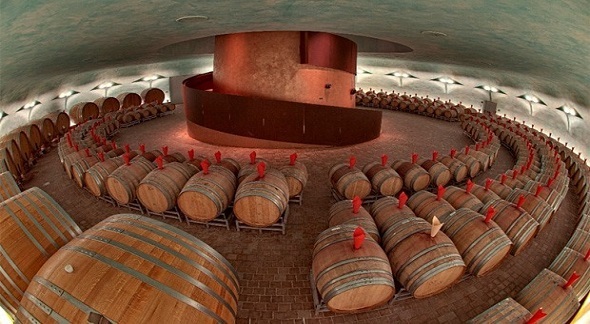 In fact it is a cellar for the production and conservation of fine wines that was conceived and created by Arnaldo Pomodoro, one of the greatest contemporary artists. 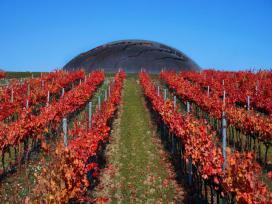 This is what Arnaldo Pomodoro said about his creation, the result of about 6 years of work in the Castelbuono estate, owned by the Lunelli family. 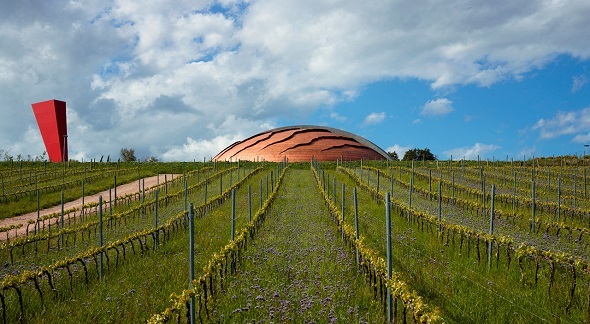 The Lunelli strongly wanted the famous artist, an old friend of them, to realize what appeared only as a dream: a cellar that could be a treasure chest for wines and an artwork in itself, perfectly inserted into the surrounding landscape . The challenge of the Carapace started precisely from the study of the place, those vineyards lying along the gentle slopes of the Umbrian hills that stretched out visibly, where Pomodoro went for several in-depth inspections. The work was to be integrated into that structure, not breaking the soft lines created by nature. The Carapace has in fact the appearance of a vast dome in copper, engraved by some "cracks" that recall the same grooves of the worked earth, with the intention of going to represent the union between heaven and earth, in continuity with this last.